Boquila trifoliolata is a vine which lives in temperate rainforests in Chile and Argentina. It looks pretty unexciting, but that&apos;s just what the plant wants you to think! The vine doesn&apos;t need any physical contact to do this. Some botanists think it can "smell" and recognise nearby plants. More outlandishly, others wonder if it might have rudimentary vision. The idea of plant vision isn&apos;t quite as ridiculous as it may first seem. So plants may be watching you with a collection of tiny, tiny cell-sized eyes. Watching you, but probably not judging you. 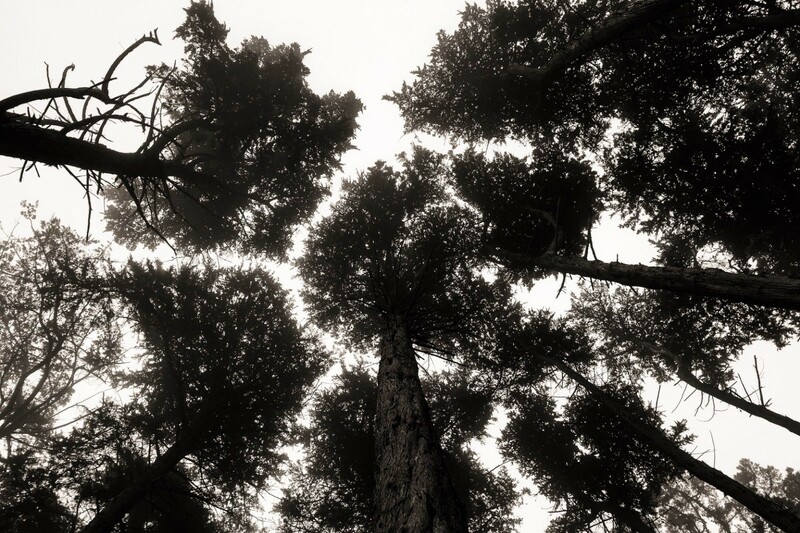 A possibly related phenomenon is called crown shyness – certain species of trees will very politely avoid overshadowing each other in a forest canopy, leaving gaps between each others&apos; branches. Again, no one&apos;s entirely sure how the trees do this, and some botanists are probably arguing about it somewhere right now. But looking at the details, this isn&apos;t a forest. The picture was taken in Plaza San Martin, Buenos Aires though. So there&apos;s a chance that your ex-wife photographed the same trees. @InvaderXan Oh, yeah, for sure she did at some point. Also, I saw the trees in person a couple of weeks ago when I walked through there. It has a lot of trees but I wouldn't call it a forest. Not a forest to you or I, but I doubt the trees realise that. Buenos Aires is on my list of places to visit someday. I should put this place on my list! @InvaderXan You'll probably like the Jardín Botánico Carlos Thays too, then. How do you mean, exactly? Heh. No worries. 🙂 And that’s an interesting thought! Some plants can sense vibrations and effectively hear. If you play them a sound recording of caterpillars munching on leaves, it makes them freak out a bit. @Steven_Vervaecke @InvaderXan only some trees form michrorhizal relationships with fungi, ecaulypts, oaks, and confiers most notably, but not all do, and chalking it up to JUST that is probably missing some things. @Steven_Vervaecke @InvaderXan yeah totally! they really do shape our communities in such an amazing way. @Steven_Vervaecke @InvaderXan and the wya nitrogen fixing trees allow so many other things to flourish!! @daylight @InvaderXan you are hitting my tree hugging weakspot. with the previous messages. yes indeed if we look at how nature is behaving. we can really learn a lot from Mother Earth. @InvaderXan I believe I've seen a similar 'crown shyness' behaviour in some Rain Trees at a local park here in Singapore (Pasir Ris Park). Here's a photo I took when I happened to stare and noticed the gaps between the trees. Oh nice! Yeah, that definitely looks like the same thing! What kind of trees are those...? @InvaderXan @sohkamyung I'm thinking that one of the ways in which this could be done is by having the trees avoid growing into the shade. It would also suggest that trees closer to the equator would have a slightly better success at this, since the sun only moves along a single line in the sky. In what parts of the world do we see this effect? Singapore is 1 degree north, which aligns with this hypothesis. That&apos;s one of the hypotheses I&apos;ve seen discussed, as it happens. Logically, seeing as most plants (especially forest plants) have shade avoidance mechanisms. @loke @InvaderXan @sohkamyung I have a picture of the same phenomenon with trees in the Presidio here in San Francisco, so it's not just an equatorial thing. Unfortunately not sure what kind of trees they are - some sort of pine tree? Nice shot! I realise I&apos;m not entirely sure how many tree species do this, where they grow, and what kind of trees they are exactly. So far, the trees I&apos;ve seen with crown shyness don&apos;t seem to have much in common, which is rather interesting! @daylight @tsturm @InvaderXan @sohkamyung Possibly. But my hypothesis was based on the fact that the sun follows a more straight path across the sky over the course of a year compared to other latitudes. If I was correct, then the trees would have a harder time to grow that way when they are moved further north. My hypothesis seems to be less and less likely. 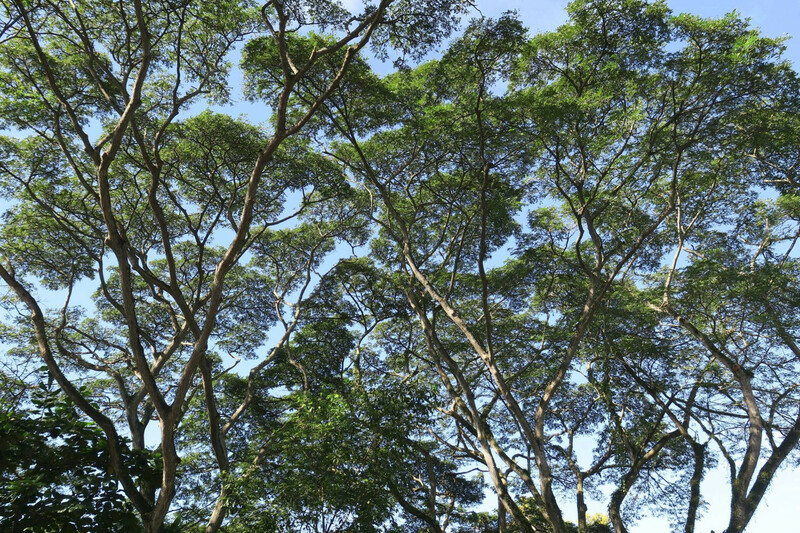 @InvaderXan Those are Rain Trees (Albizia saman). Brilliant, thank you. They have lovely flowers! They’re albizia saman. I think there’s a reply in this thread which you missed. But yes, sometimes the English names for things are a little ambiguous, huh? @InvaderXan this is such a good thread!! Diversity is key. And, in my opinion, it&apos;s one of humanity&apos;s greatest strengths. Suppressing our diversity weakens us all. @InvaderXan Isn't it so cool! How trees communicate with one another and leave room for the smaller fauna and flora to grow, because they know that they need them to continue to sustain themselves. I think I also saw a thing where they can share resources when necessary? Trees are freaking bomb. @InvaderXan I read a book about this recently. Trees are incredible. They even talk to each other, in a fashion, and will work together to help a nearby tree that is ill by feeding it nutrients.